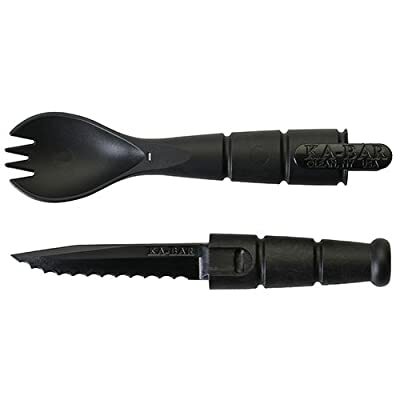 Introducing our new 2 in one multifunction Ka-Bar Tactical Spork perfect for various occasions like camping, hunting and fishing. Highly recommended sturdy polymer plastic material plastic spork is durable and long lasting making it effective and long lasting. One of the best feature of camping spork is that it could be separated in half and becomes multifunctional. Pretty cool little setup also contains a pretty decent knife with it. Multitool, fairly in expensive, Food and detergent safe, perfectly designed to be an advanced compliance tool You could eat with it also helpful in self-defense. Overall length: 6.875-inch folding spork is made in USA, Extremely light weight.